The region of deversities ... The very busy and musical capital city Santiago de Cuba, the beginning of the Sierra Maestra Mountains ... province where the revolution started at July 26 1959. It is bounded on the west by Granma Province, on the north by Holguin Province and on the east by Guantanamo Province. To the south, the Caribbean Sea bathes its coast. Most of the beaches are spectacular, with dark sand or pebbles and the Sierra Maestra Mountains as a backdrop. The 1215-square-mile tourist region has three well-defined areas: the Sierra Maestra Mountains, Santiago de Cuba Basin and the coastal plain. 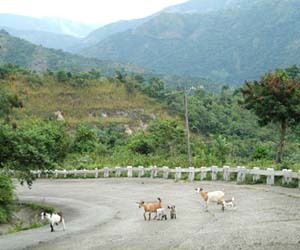 The province has good roads that connect it with its neighboring provinces, and is also linked to the rest of the country through the port of Santiago de Cuba. Visitors from abroad can come to Santiago de Cuba through Antonio Maceo International Airport, Guillermon Moncada Port and the Punta Gorda International marina. 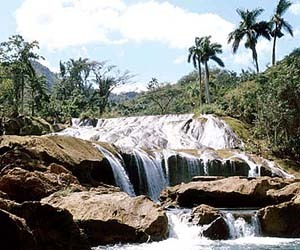 The Baconao World Preserve of the Biosphere, the Guama area (El Mazo and El Papayo Bay) and the northern subregion of the Sierra Maestra Mountains (El Salton and El Cedron) also form a part of the Santiago de Cuba tourist region. 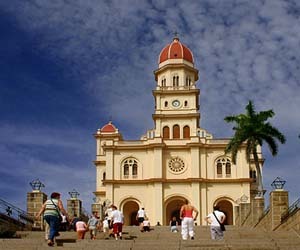 Santiago de Cuba is a tourist destination combining many values and attractions, which enables visitors to come into contact with the distinguishing characteristics of its people and the culture and history of the province while, at the same time, enjoying its exotic beaches and other well conserved natural attraction. From the historic-cultural point of view, many aspects of this province which is known as the cradle of the son and of the bolero and where traditional ballads and choral expressions are deeply rooted are unique. This explains why the city of Santiago de Cuba hosts so many important artistic and other cultural events, such as Caribbean Festivals, International Chorus Festivals, Miguel Matamoros Son Festivals, Pepe Sanchez International Festivals of Ballads and Bolero Festivals. The first house that Europeans built in the Americas, the first cathedral erected in Cuba, the first open-sky copper mine in the Americas and the first museum in Cuba are all in Santiago de Cuba. Its rum made from sugarcane and aged in oaken barrels is the best of all the rum produced in Cuba and even in all of the Antilles, and UNESCO has declared the impressive colonial fortress called the Castle of San Pedro de la Roca del Morro to be a part of world heritage. It is the vastest, most complete example of early renaissance military engineering in the Caribbean. This is the place where Hernando Cortes set out on his conquest of Mexico and the one to which scores of French immigrants flocked in 1791, after Toussaint L'Ouverture's Haitian Revolution and introduced coffee growing in Cuba. The Baconao Preserve of the Biosphere is another place that's well worth visiting. The enormous natural park has beaches, woods and cultural offers open-air exhibits and museums. There are also trails for hiking and series of scuba-diving centers along the coast. For scuba-divers, there is a well-preserved coral reef in clear, pure water and 73 wrecks on the insular shelf. The most important shrine for Cubans and most famous church in the country is lodged in the foothills of the Sierra Maestra near the old copper mines that give it its name. The triple-domed church with the mouthful name of El Sanctuario de Nuestra Señora de la Caridad del Cobre, built in 1927, rises on Maboa hill and is photogenically framed by green forest. The faithful come from across Cuba on pilgrimages to pay their respects to (and ask for protection from) a black Madonna, the Virgen de la Caridad (Virgin of Charity). She is nothing less than the protectress of Cuba, and her image, cloaked in a glittering gold robe can be seen throughout the country. Her parallel figure in Afro-Cuban worship is Ochún, goddess of love and femininity, who is also dark-skinned and dressed in bright yellow garments. In 1998 the Pope visited and blessed the shrine, calling the Virgin "La Reina de los Cubanos" (Queen of Cubans), and donated a rosary and crown. According to legend, Cuba's patron saint was rescued bobbing in the Bay of Nipe in 1611 by three young fishermen (or miners, depending on who's telling the story) about to capsize in a storm. The Madonna wore a sign that read YO SOY LA VIRGEN DE LA CARIDAD (I am the Virgin of Charity). With the wooden statue in their grasp, they miraculously made it to shore. Pilgrims, who often make the last section of the trek on their knees, pray to her image and place mementos (votos) and offerings of thanks for her miracles; among them are small boats and prayers for those who have tried to make it to Florida on rafts. Ernest Hemingway -- whose fisherman in The Old Man and the Sea made a promise to visit the shrine if he could only land his marlin -- donated his Nobel Prize for Literature to the shrine, but it was stolen (and later recovered, but never again to be exhibited here). The Virgin sits on the second floor, up the back stairs, encased in glass. When Mass is being said, the push of a button turns the Virgin around to face the congregation. The annual pilgrimage is September 12, and the patron saint's feast day is July 25. The Basílica is open daily from 6am to 6:30pm; admission is free. You can take a taxi to El Cobre for $20 to $30 round-trip. The no. 2 bus runs between Santiago and El Cobre four times daily, leaving from the main bus station in Santiago. To enhance the spiritual experience, or to merely have a serene and incredibly cheap overnight stay, there's an inn behind the church, Hospedería de la Caridad, which welcomes foreigners who abide by the strict rules; a stay costs a mere 10 pesos a night (38¢), although they generally charge foreigners a few dollars. There are only 15 austere but well-kept rooms; it's necessary to reserve by phone (tel. +53 22 36246) at least 15 days in advance. The place where the Command Headquarters of the Second Front of the Rebel Army was based under the command of the Commander Raul Castro. Today, it is not only a cultural complex with a mausoleum to honor the martyrs of the second front but also a municipal museum. The Siboney-Justici Ecological Preserve and the Gran Piedra mountain, which is classified as protected natural scenery, are also "musts" Gran Piedra is an enormous rock on top of a high mountain. It weighs around 75.000 tons. In terms of both volume and weight, it is one of the largest rocks in the world. Nearby there are ruins of French coffee plantations, testifying to the Franco-Haitian influence in the area. They are a part of world cultural heritage. 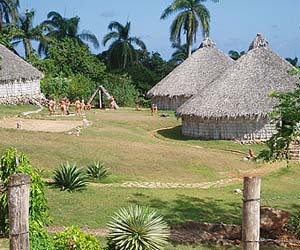 A UNESCO biosphere reserve, Parque Baconao is spread over some 40km (25 miles). The local dark-sand beaches are scruffy and the hotels are isolated, but the park hides a number of attractions, several of them man-made, for visitors with a couple of extra days in Santiago. The road leading southeast out of Santiago is lined with 26 monuments to revolutionary heroes who died in the attack on the Moncada barracks. About 10km (6 miles) east is the Valle de la Prehistoria, Carretera Bacanao Km 6.5 (tel. 22/63-9039), Cuba's very own but lifeless Jurassic Park and cheesiest attraction.Lodged on farmlands are 250 massive life-size statues of dinosaurs and a giant, club-wielding Stone Age man. The park is open daily from 8am to 6pm. Nearby, in a nod to more recent history, the Museo Nacional del Transporte (Automobile Museum), Carretera Bacanao Km 8.5 (tel. 22/63-9197), has a decent number of old cars, some more valuable and in better shape than others. One vehicle, a 1951 Chevrolet, was driven by Fidel's brother Raúl to the Moncada attack (he got lost); a Cadillac on view belonged to the legendary singer Beny Moré. 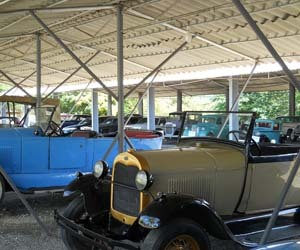 The museum's collection of vintage American cars has been built by the novel practice of offering Cubans new Russian-built Ladas for their old Cadillacs and Chevys. Next door is a collection of several thousand model and Matchbox cars. 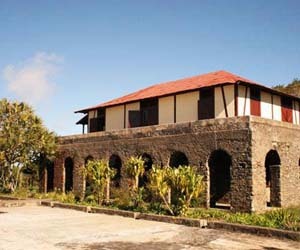 About 2km beyond Gran Piedra, a passable dirt track leads to Museo La Isabelica, Carretera de la Gran Piedra Km 14, an early-19th-century coffee plantation finca (country house) that once was the property of newly arrived French immigrants who fled Haiti after the slave revolt there in 1791. The owner named La Isabelica for his mistress (and later wife), a beautiful slave. 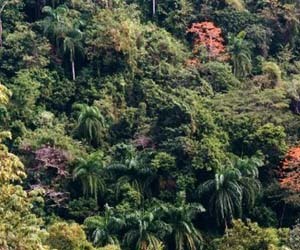 Those who want to enjoy the natural attractions of this territory should definitely visit the Sierra Maestra Natural Park, consisting of the youngest, most extensive mountain system in the country. It includes 17 peaks that rise to over 4265 feet above sea level. Turquino Peak, at 6476 feet above sea level, is the highest of them and the highest mountain in the Cuban archipelago. A memorable battle of the Rebel Army (Ejército Rebelde) against the troops of Batista’s dictatorship took place in this area of the present day municipality of Guamá on May 28th of 1957. Commander in Chief Fidel Castro led the combat. It is known as the greatest battle fought by the Rebel Army (Ejército Rebelde) and was a starting point for developing the insurrectional struggle against the enemy forces, demonstrating the existence of the struggle that could no longer be hidden by the authorities. The high combat capacity of the Rebel troops was proved, as well as the importance of the farmers in the area, in collaborating and fighting side by side along the troops. According to Che this battle marked the coming of age of the Rebel Army (Ejército Rebelde). It was declared a National Monument on December 25th of 1979.